Have a look at this site, http://www.dynamite.co.uk/local/ 'Local Knowledge', which displays BBC travel news, BBC London traffic cams, local weather, geotagged Flickr photos and Gatso speed cameras and then perhaps read the Guardian story attached to it here. 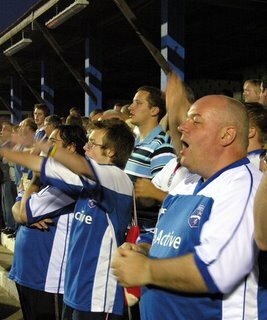 Who ate all the pies ,Who ate all the pies well from the look of it I did ! That game was good fun. If I remember correctly there was a five minute chanting session at the start of the game from that end.